As part of the Handmade Gift Exchange, sponsored by Linda at Craftaholics Anonymous, I sent my gift partner this Anthropologie-Inspired Bracelet that I found on Flamingo Toes. Hand-sewing the yo-yos was surprisingly therapeutic! The bracelet before adding the extra bling is also pretty cute! I already had most of the supplies in my fabric stash. You can change up the bling and the yo-yos to make a lot of different styles. If I made another one, I'm not sure I would use hot glue for the filigree bling. The glue kind of went through the tiny holes and I had to scrape a lot of it off. 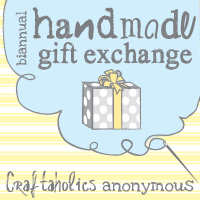 Many thanks to Linda at Craftaholics Anonymous for organizing the Handmade Gift Exchange! Count me in for November! This is soooo great!! I love the way your bracelet turned out - that ribbon is so pretty and the bling you used is just perfect!! Thanks so much for the link too! Your partner is going to love it!! This is very pretty! I love the embellishments! oh yea! i want to try yoyo making too!!! but i love your final bling touch!!! two thumbs up! GAHH! look at those tiny yo-yo's! i wish i had cool friends that would wear this.